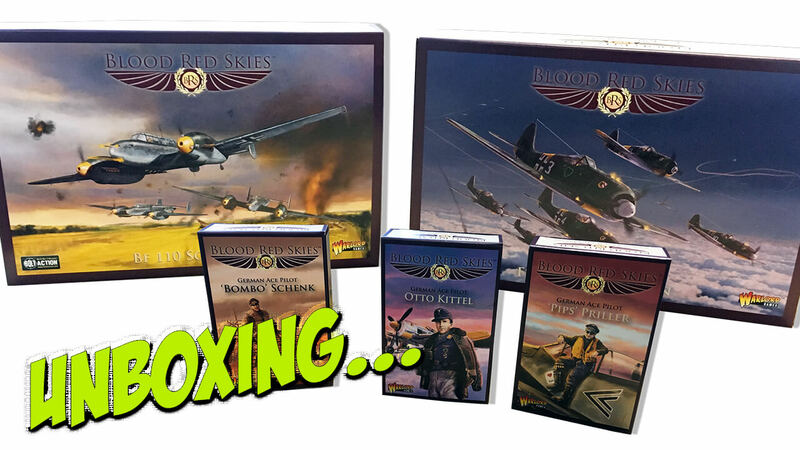 Warlord Games continue to support their Blood Red Skies World War Two aerial combat game with new releases. This time around we have new German fighters in the form of squadron boxes, complete with Ace Pilots. The first new release is the Fw 190A Squadron. We’re moving past the end of the Battle of Britain here, where the ‘defeated’ Luftwaffe introduced a heavily armed fighter from the Focke-Wulf stable which could not only deliver a heavier punch than the much vaunted Spitfire but could also out-fly it to boot. The box contains 6 plastic Fw 190A fighter aircraft, complete with enough Advantage Flying Bases to field all of them at the same time. There are enough Pilot Skill discs for each of the bases. The discs are double-sided, allowing for pilots with differing abilities to be used in the ‘squadron’. Other tokens included are standard for the game, all produced in a durable cardboard. Also included is an aircraft data card with all the relevant game stats, plus a Doctrine card, in this case Low Altitude Performance, which can be used within the game. In order to reflect the unique abilities of the Fw190A, there are 3 Rapid Roll and 3 Robust cards which can be used during the game to out-fox the enemy. Lastly, a waterslide decals sheet enables the detailing of your final painted models. To support the release of the Fw190A in the game, there are two new Ace Pilots. ‘Pips’ Priller and Otto Kittel both made their names as Aces early in the war, largely as pilots of the Fw190A. Both boxes contain the same plastic aircraft, base, Pilot Skills, etc. as the squadron pack, but then have unique Ace Skill and Ace Pilot cards for the individual pilots. Great to uses as leaders of a squadron or as back-up during games. The second boxed set is the Bf 110 Squadron. The Bf 110 was a twin engine aircraft which was originally conceived as a ‘heavy fighter’ for use by elite pilots. During the Battle of Britain, it was found to be reasonably effective in terms of armament but struggled to deal with British aircraft who could out-fly them. It was then tasked as a fighter-bomber, anti-bomber and night fighter for the rest of the war, where it achieved a fair amount of success. Again, the squadron box follows a familiar pattern, with plastic model aircraft, bases and a punchboard of pilot discs and chits. However, this boxed set has cards for two variants of the aircraft, the Bf110 C and G, a Doctrine card called Seasoned Pilots which effects the use of top quality veteran pilots and 7 Aircraft Trait cards which reflect the arms and flying abilities of the aircraft. The accompanying Ace pilot box represents ‘Bombo’ Schenk, with all his individual skills and abilities recorded on accompanying cards. As a squadron leader for Bf 110’s, ‘Bombo’ would add that ‘wild card’ to an already experienced group of pilots, perhaps tipping the tide of combat at just the right moment. These ‘reinforcements’ for those who use German aircraft in Blood Red Skies help to move the ‘action’ beyond the Battle of Britain and add something suitably different to the game. In addition, the Ace Pilots offer the opportunity to surprise the enemy or pull out that ‘ace in the hole’ which can turn the tide of battle. Yet more options for a game that is as much about proper use of tactics as it is about an ‘arms race’.